Cartoon Network is renewing Steven Universe for another two seasons, ensuring that fans continue to get the combination of catchy songs and gem-based relationship adventures that they’ve come to expect from Rebecca Sugar’s massively popular show. 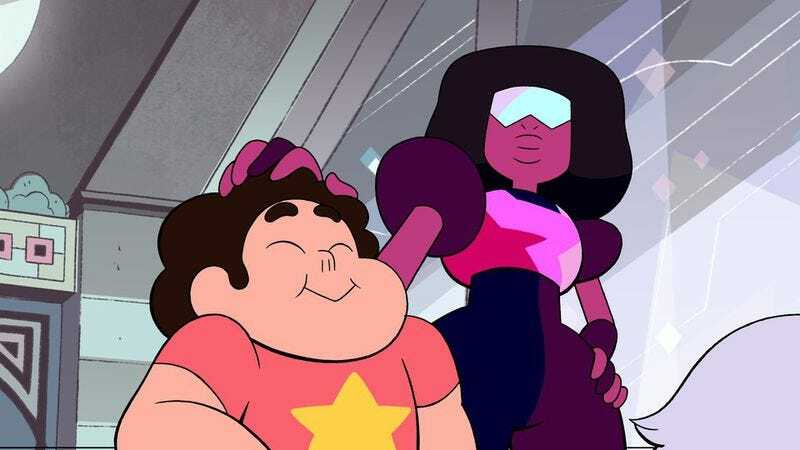 And while Steven’s unorthodox delivery schedule—which sees fans (and reviewers) scramble to catch up every time a “Steven bomb” of episodes gets dropped on them—makes it hard to predict how far out the show’s run will now extend, viewers can expect to see new episodes of the series arrive this June. Steven Universe wasn’t the only Cartoon Network show to get bumped up to five seasons today, either. Its network-mate (and former crossover partner) Uncle Grandpa also got a two-season renewal notice. That being said, Uncle Grandpa doesn’t seem to inspire quite the same level of fervent online devotion as Steven (at least, going by the respective results for “Steven Universe tattoo” and “Uncle Grandpa tattoo” on Google), so we figured we’d lead with the news more likely to generate Tumblr-shaking squeals of internet delight.